First let me start by trying to explain a little bit of linguistic confusion around the use of the word bread. The Polish for bread is chleb and is used for rye bread and any bread which contains at least some rye flour. 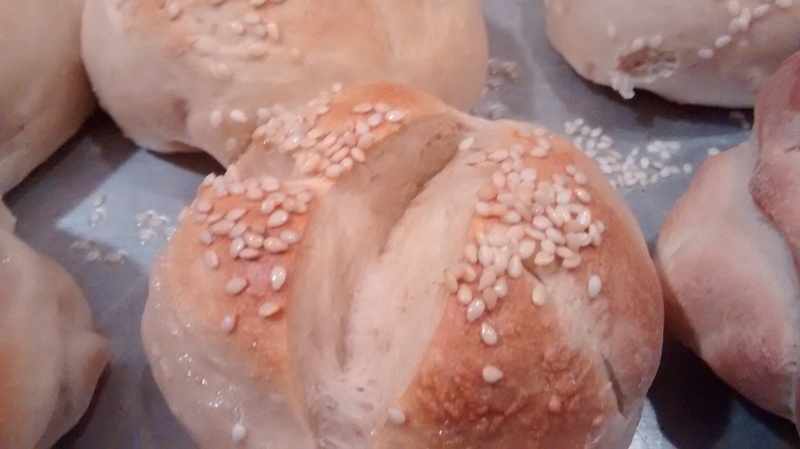 The word bułka means a loaf and bułeczka means a little loaf or roll (bułeczki – is the plural) and these words are used for soft wheat loaves or rolls. So bułeczki are what in England are called bread rolls or bread buns. 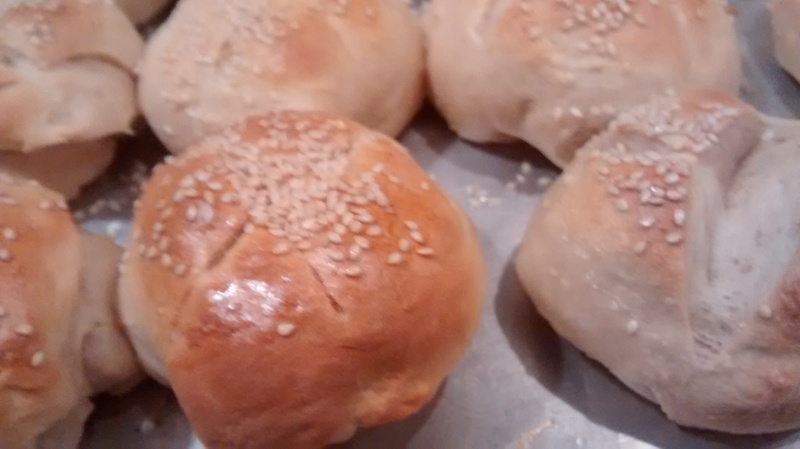 However the word is also used for sweet dough yeast buns or sometimes small cakes in general. The following instructions are for an enriched dough for bread rolls or buns – that is a dough with added milk, butter and eggs. Learn to be patient – you cannot control the timings exactly with yeast, it depends on the temperature of the room and the flour used and other variables. Do yeast baking on a day you are planning to be in & have other things to do, but ones you can break off from when needed. Heat the milk so it is at body temperature – use the finger test – too hot and you will kill the yeast – too cold is okay – it will just take longer. Strong flour gave me the best results. Have the dough as wet & soft as you can handle – do not be tempted to add more and more flour as you form the dough at the beginning. 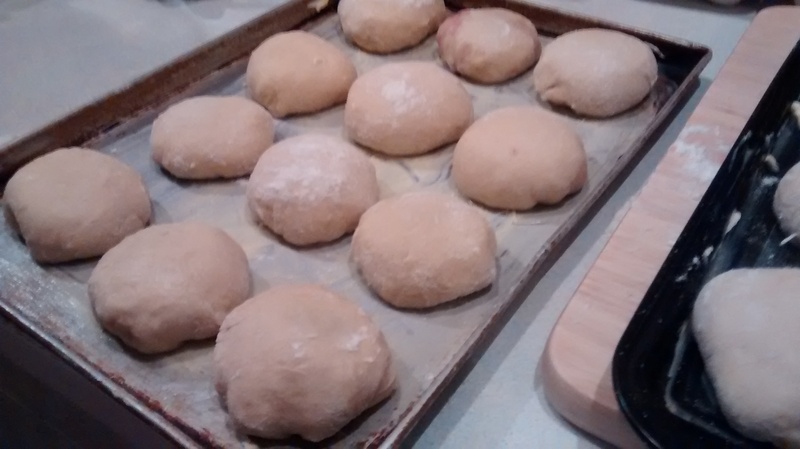 Knead the dough as much as possible – it can be quite relaxing once you get going. Use the amount of salt as and when stated in the recipe, it gives the bread taste and controls the yeast. An egg glaze often burns too quickly – I have found an egg white or egg white & water glaze gives a better result. 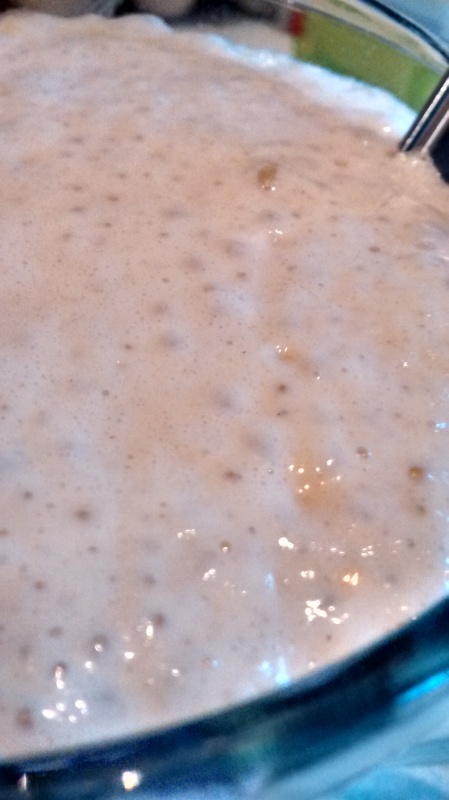 The Polish recipes I have looked at make a rozczyn – a leaven in the form of a batter or starter to begin with – I have liked using this method very much. 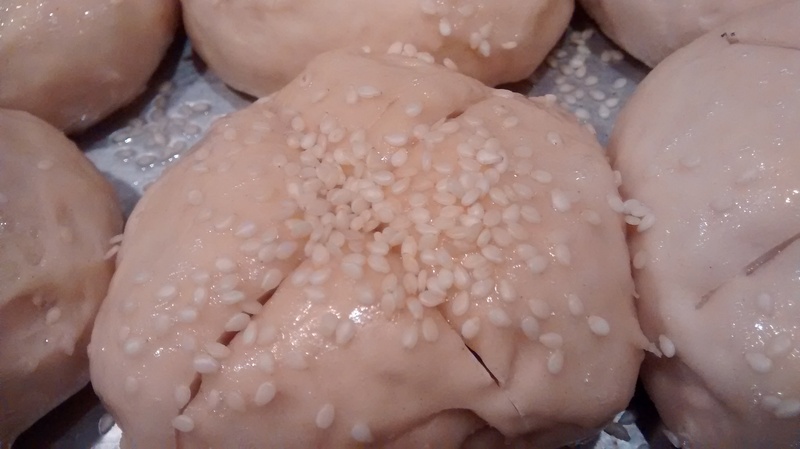 The older Polish recipes use fresh yeast. 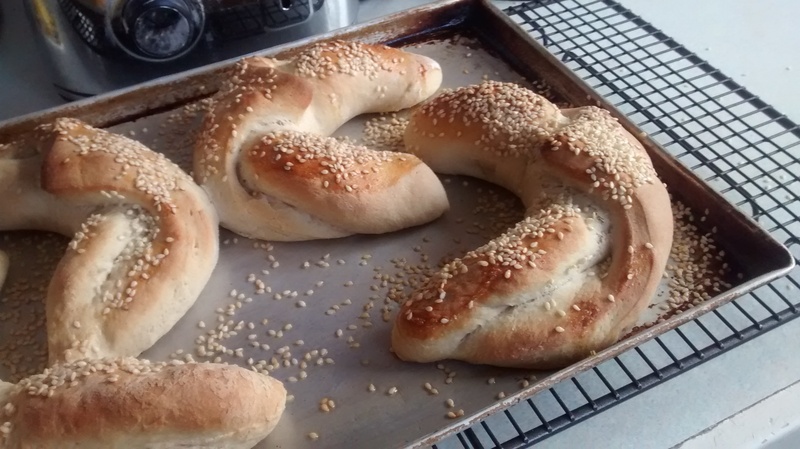 I have used dried yeast and had very good results. 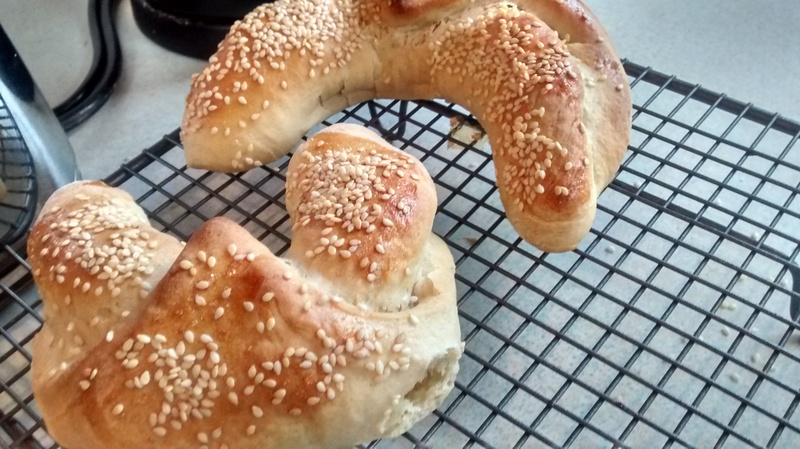 (I have not tried using easy bake yeast for this recipe). 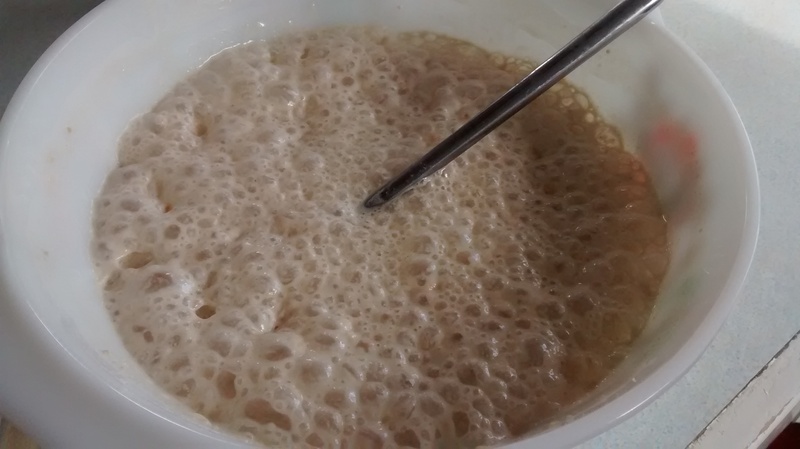 Mix the yeast and sugar with the warmed milk – if using dried yeast leave for a few minutes to let the yeast start to work. Put the 100g of flour into a bowl and add the milk and yeast mixture, mix it all in to form a batter. Cover the bowl with a tea towel or cling-film and leave it to rise. Put the 400g of flour in a large bowl. Whisk the egg with the salt. Add the leaven and the egg mixture to the flour and bring it together by hand to from a ball. You might have to add extra milk to get a soft ball – try not to add more flour. Turn the dough out onto a firm surface and knead until you have a nice smooth ball – one of my books says do this for 30 minutes! – knead it for at least 10 minutes. Now this is the hardest part! Flatten out the dough and pour the butter or oil over it. 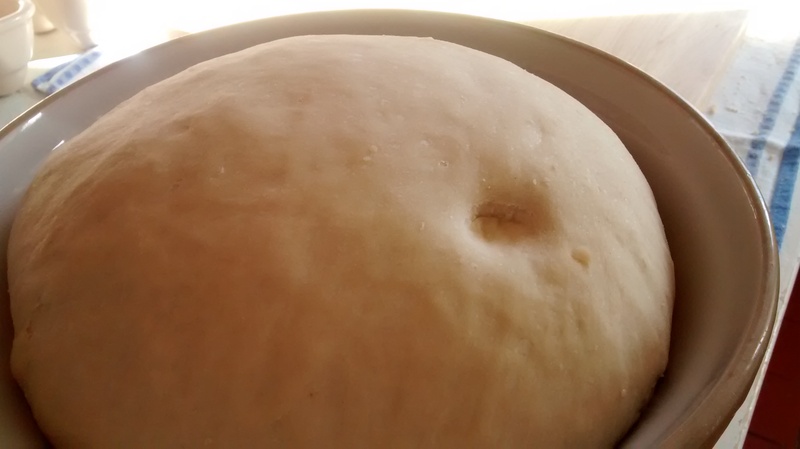 Then incorporate the butter or oil into the dough and knead it until once again you have a nice smooth ball. Place the dough into a clean bowl and with a tea towel or cling-film and leave it to double in size. Take the dough and on a floured surface roll it out into a rectangle. The next part is to shape the dough, brush with an egg white wash and sprinkle with seeds as desired and bake for 15 minutes. This amount of dough will make 12 buns. 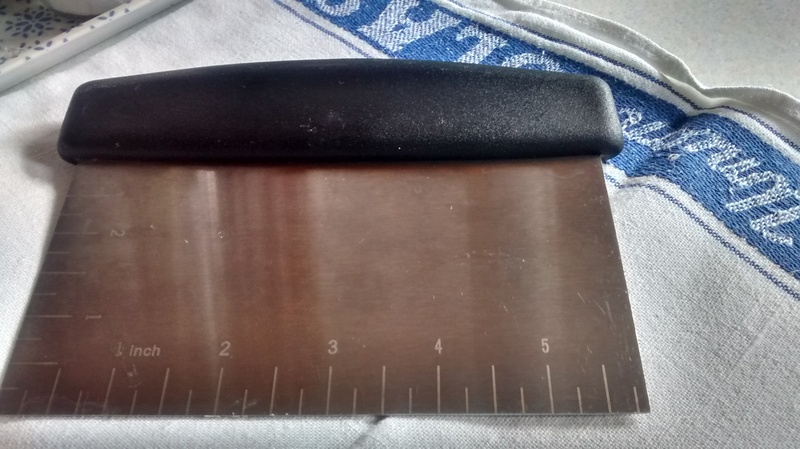 Use a sharp knife or a dough cutter to divide the dough. 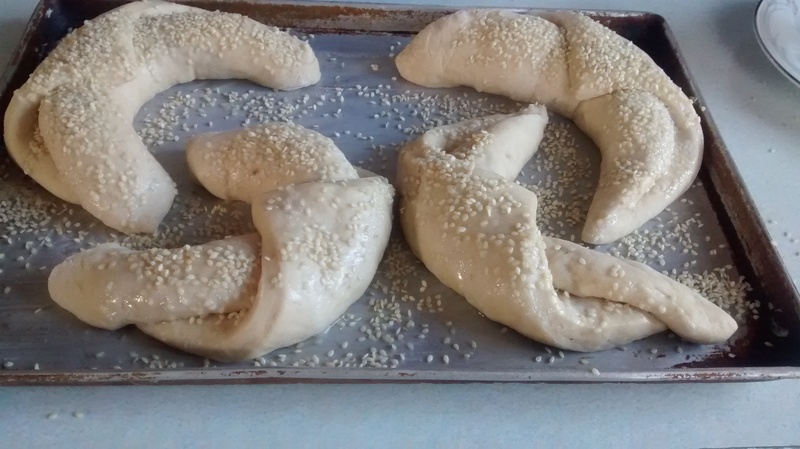 Divide the dough into 2, then each half divide into 2 again. Then divide each piece into 3 equal pieces so giving you 12 pieces. 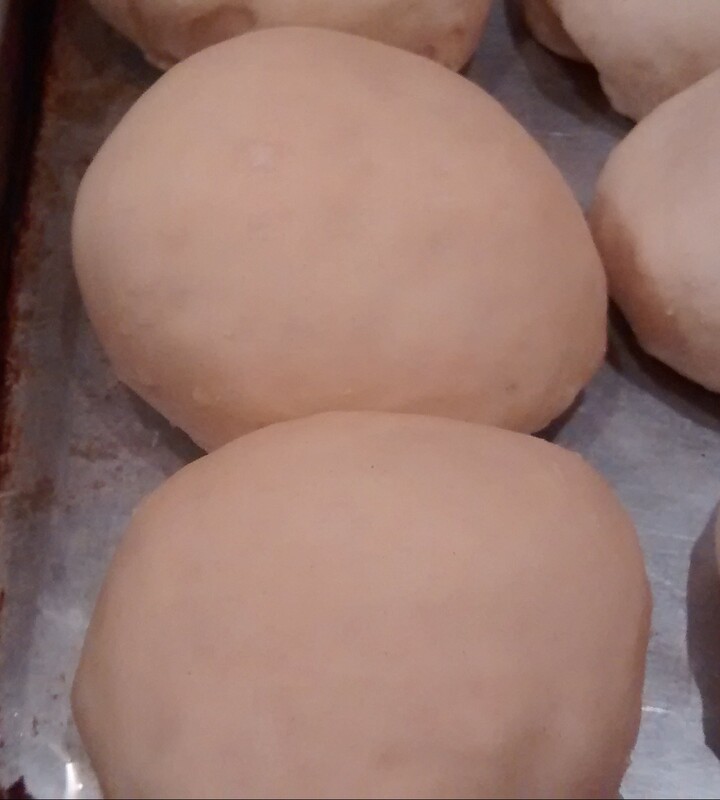 Roll each piece of dough in your hands to make a smooth round ball. Place these on the greased baking sheet with space between them for them to rise. 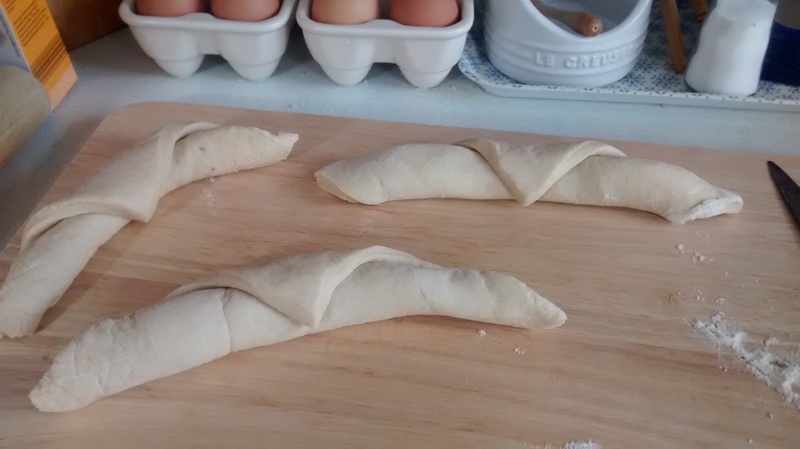 Cover loosely with a cloth and leave them to rise. Make an egg white wash by whisking an egg white in a little bowl or an egg white and 1 tablespoon of water. Use a pastry brush to brush the tops of the buns. 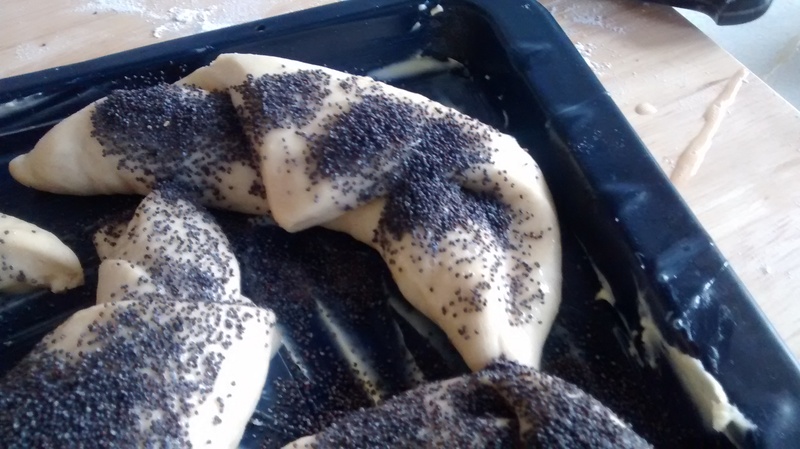 Sprinkle with poppy or sesame seeds if desired. Bake for around 15 minutes until they are golden brown – check a little earlier and move them lower in the oven or lower the temperature if the tops are beginning to burn. 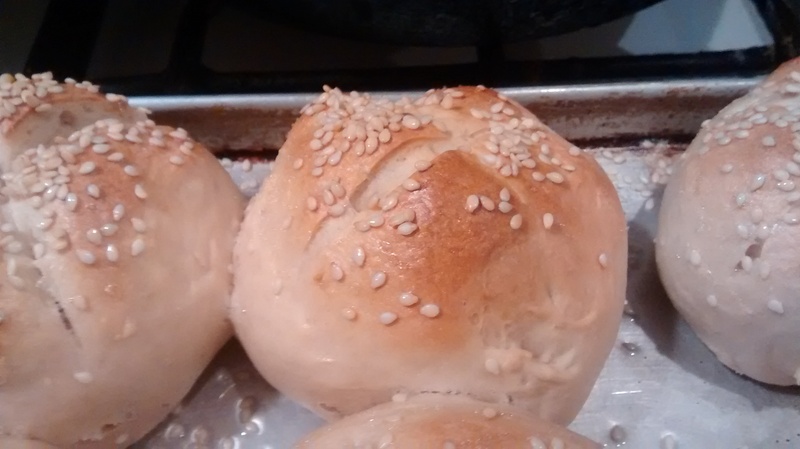 These are Kaiser rolls and originated in Austria – they are meant to look like a crown for the Kaiser. Cut a cross on the top of the dough using a sharp knife – this expands as the dough rises – or you can make 3 cuts to make a 6 pointed star. 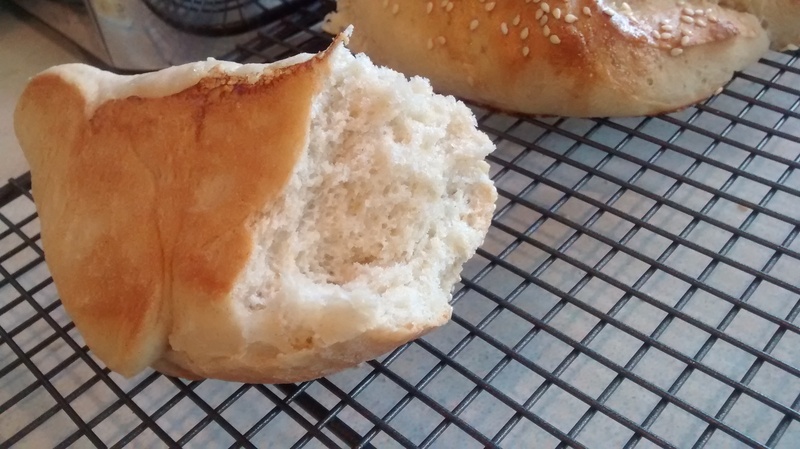 However the traditions Kaiser roll does in fact have a 5 point cut at the top. 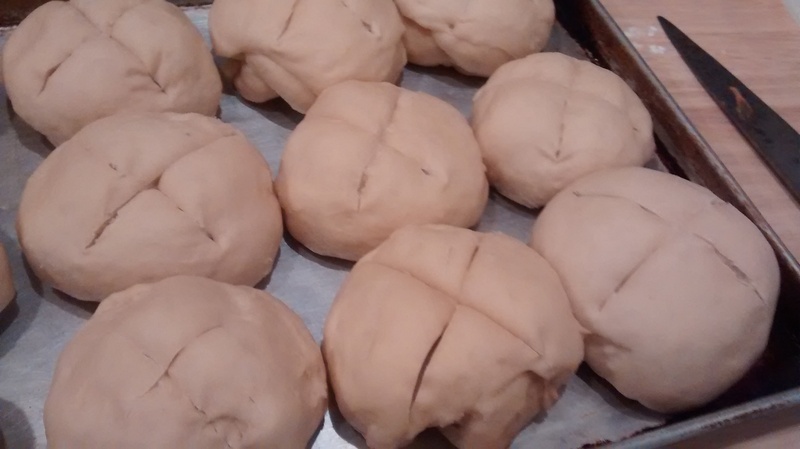 Cut a cross in the top of each bun – cover them with a cloth and leave them to rise. A couple of days after making these rolls I went to Harrogate and saw this crown! 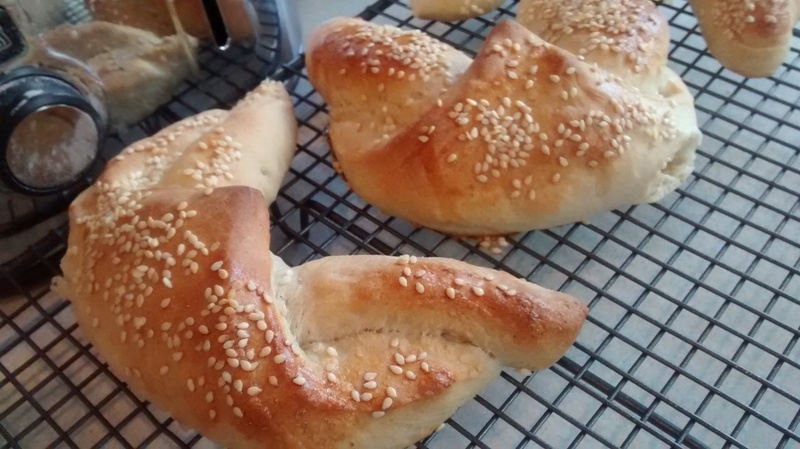 Rogaliki means little horns and these rolls are made into a crescent shaped which look like horns. This amount of dough makes 8 rolls and you will need 2 greased baking sheets. 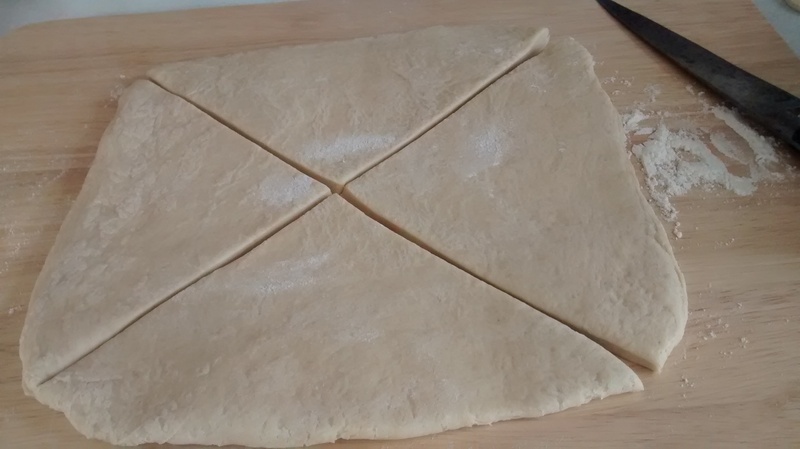 Take the dough and divide it into 2, take each piece separately and roll it out into a rectangle, as thinly as possible, and cut this diagonally across to make 4 triangles. Starting with the long end roll up each piece ending with the point at the top. 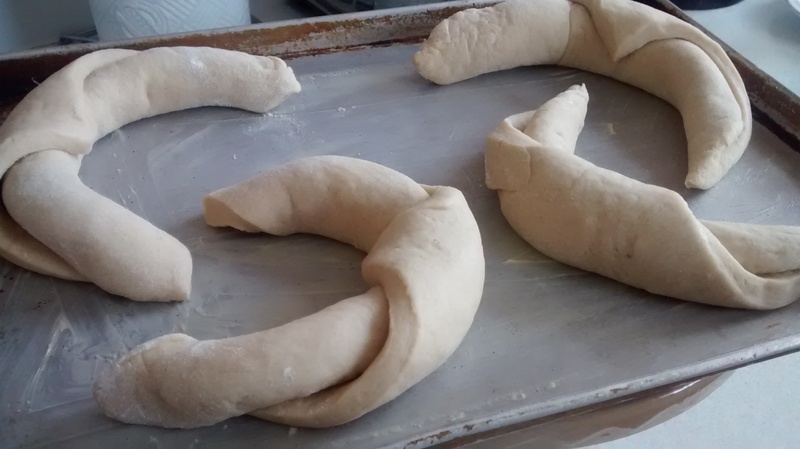 Curve the shape around to make a crescent shape. Place these on the greased baking sheet with space between them. Cover loosely with a cloth and leave them to rise. Brush with the egg white wash and sprinkle with seeds as desired. Hi from Turkey. 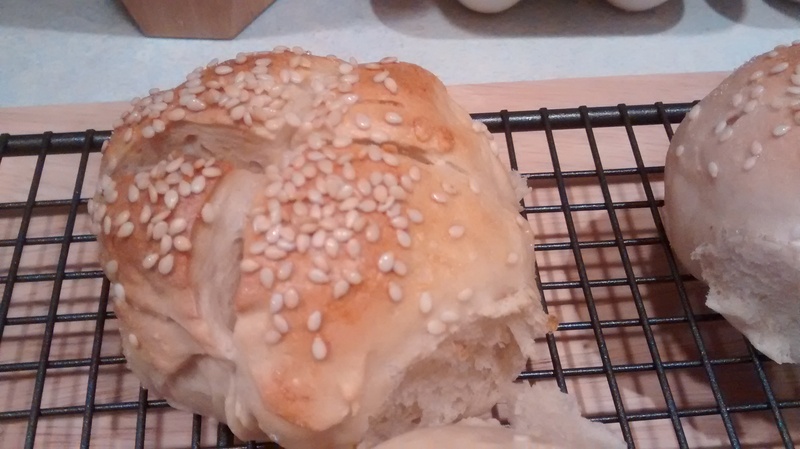 Your recipe looks very nice and i’ve few questions about polish breads like this. how can i contact with you like mail or something. 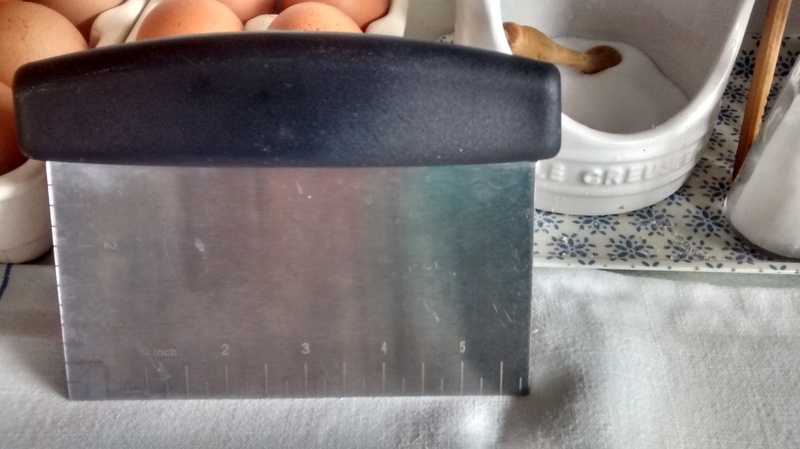 You can contact me through this blog – if you write a question in the comments I can answer it as I am doing now – so that the comments keep with the recipes on the blog.